In yet another example of leftists attempting to silence those on the right, a group of conservative comic book creators are being targeted by social justice warriors. A group of comic book creators has begun dealing with an issue seen in many other industries — the silencing of conservative voices simply for being conservative. 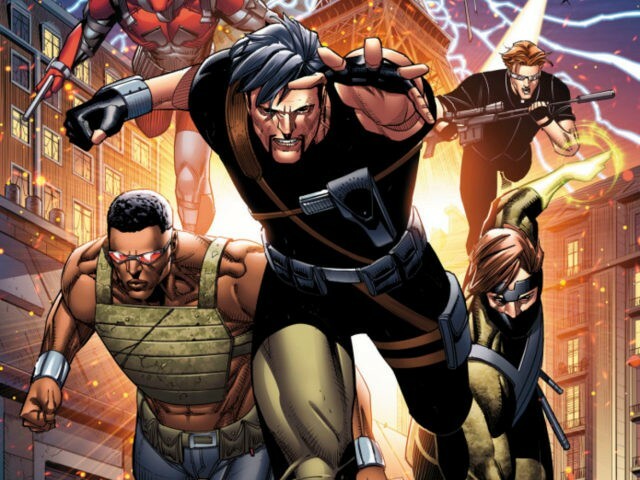 Brett R. Smith, Jon Malin and Richard Meyer (better known by his YouTube handle Diversity and Comics) recently announced a new graphic novel titled Jawbreakers. The graphic novel is written by Meyer, drawn by Malin and colored by Smith, and is actually not a political comic book. The plot is described as “A team of ex-superheroes attempt to save a “monster” from a vicious warlord who wants to exploit it!” The team of comic creators took to crowdfunding platform IndieGoGo to gain financing for the graphic novel and have currently raised $261,509 from comic book fans eager to read the new novel. Malin and Smith are both veterans of the comic book industry having worked for the “big two” companies, Marvel and DC, while Meyer has gained a large following online for his critical reviews of modern graphic novels and comics. 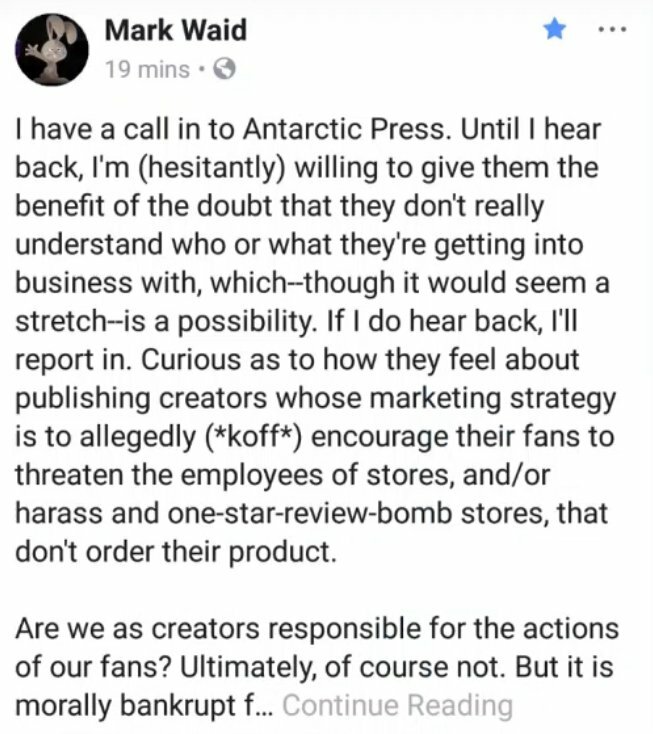 After careful consideration, it is the decision of Antarctic Press to not release the comic series Jawbreakers. Many forces, many of them should be viewed with great trepidation about how our society acts, have led us to this decision. We do not take this decision lightly as we do believe that there should be separation between “ART” and the “ARTIST” and that separation has been blurred in our decision. We appreciate all our supporters and detractors in this process. Thank you for taking the time to read our statement. This statement will be removed in 7 days. Splatto Comics will be obviously comic centered. That’s what we love. That’s our thing that we do. It’s going to be a variety of things. Exclusive crowd-funding campaigns, for example my Iron Sights graphic novel might only be available in IndieGoGo. The 112 page one is exclusive. It will not be in stores in that 112 page thing. The only way you can ever get this is through this IndieGoGo. We are going to do exclusive IndieGoGo’s for something like Iron Sights probably. Moving forward on a way to get it into brick and mortar stores like Barnes & Noble and Amazon and things like that. And then we’re also going to go for things like maybe the Jawbreakers Digest the traditional route into comic book stores through Diamond. We were able to turn Clinton Cash into a New York Times number one bestseller and I just don’t think that’s a fluke. And then you look at the reaction to Jawbreakers, there really is a huge underserved audience out there, you see that with [the TV series] Roseanne, 28 million people turning up to watch her, you see that now with Last Man Standing coming back. Then you see it with things like American Sniper, or the Passion [of the Christ], when something is catered towards the mass majority of the country in a commercial way that doesn’t lecture, people eat it up. And it’s not that any of it is political, I get back to the fact that it’s pro-Western culture. That’s really kind of the bullseye that we need to focus on, does it advances Western culture and Western philosophies, and if it doesn’t we’re not interested in it, I don’t wanna do it. Jawbreakers is set to be released to IndieGoGo backers in August 2018, Breitbart News will be publishing a full review of the highly anticipated independent graphic novel when it is available.